Nothing beats a homemade burger. Put the minced beef into a large mixing bowl. Add in the finely diced onion and garlic. Mix in the bread crumbs, Parmesan cheese and chopped parsley together with the tomato chutney. Season the mixture with a little salt and pepper. Add in the egg and mash the mixture together with your hands using the egg as a binding agent. Divide the mixture into 4–6 pieces and shape them into your desired shapes about ½ inch thick. Allow to rest in the fridge for at least 30 minutes. Brush the burgers with a little oil to prevent them from sticking and barbecue on either side for 4–5 minutes. Cut one in the centre to make sure that they are cooked through. 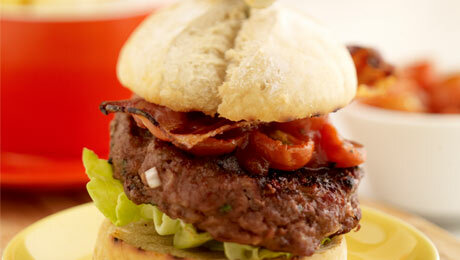 To assemble your burger, spread some chutney on the bottom layer of the toasted burger bun. Then add the bacon, place the burger on top and add your favourite dressing like mayonnaise, caramelised onions, sliced tomatoes or sliced gherkins etc. Serve with freshly cooked chunky chips or on its own.